Today the majority of the hoops sold are in ground systems or portable basketball hoops. For those who are looking for a simple rim and backboard unit to attach to a wall or garage the number of options have become more limited. One really solid option if you want a rim and backboard system is the Spalding 79564 Backboard and Rim Combo. It works great for those who have a garage or indoor environment where you want to hang the hoop from. One strength of these systems is the simplistic assembly compared to portable and in ground systems. The Spalding Backboard and Rim Combo has a great number of features that make it a great option for your home. The system has a medium sized backboard of 54 inches, which is made of acrylic. Acrylic is a nice middle of the road material that is higher quality than polycarbonate, and not as expensive as tempered glass. The bottom of the backboard is aligned with padding that will protect any players who go up for a layup or dunk. 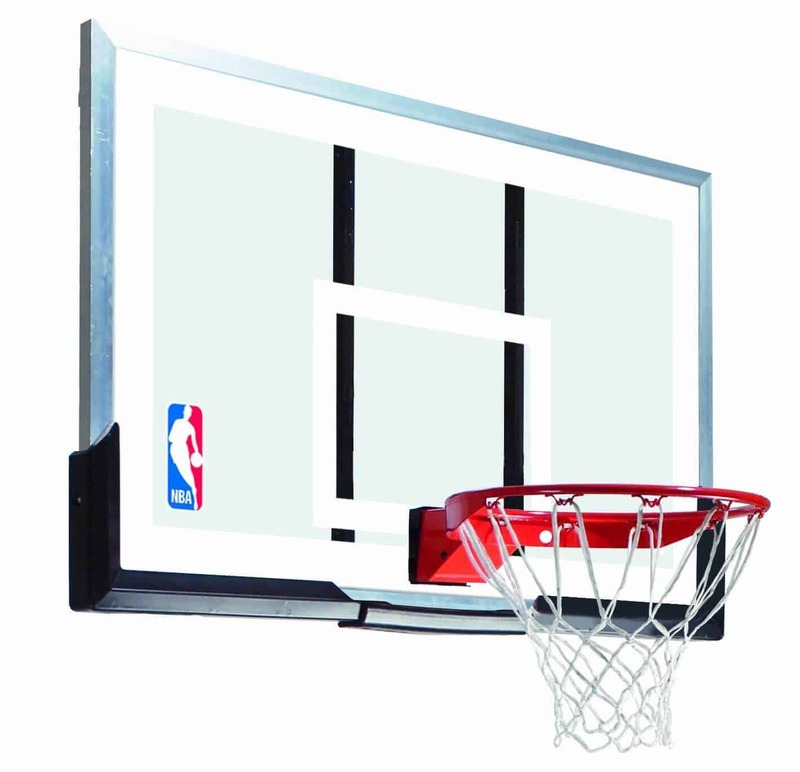 Another feature of this hoop is the arena slam breakaway rim. This rim has a covered spring mechanism that allows for breakaway flexibility when dunking. On the rim there is an all-weather net so that outside it will not wear down due to the elements. 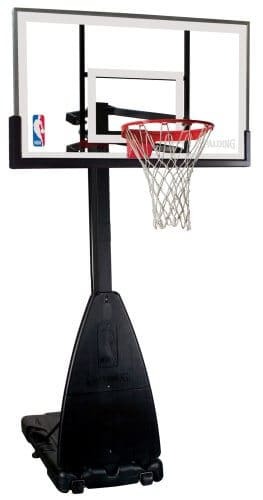 One thing that we really like about wall-mounted hoops is that they tend to provide strong backboard support so that rebounds come off with velocity unlike some portable basketball systems. With the Spalding 79564 Backboard and Rim Combo this reputation for strong backboard performance continues. This system comes ready to be mounted to an existing pole, but will require a wall-mount bracket if you are going to hang it from a wall. The Spalding 79564 Backboard and Rim Combo is a great option for those with a garage or other building to mount the hoop to. If you want a similar quality Spalding hoop that is portable then we suggest the Spalding 60″ Portable Basketball System, and for in ground the Spalding 60″ In Ground Basketball System. The Spalding Hercules Portable Basketball Hoop is one of the newer portable basketball systems offered by Spalding. As you may already know, Spalding has been a leader in manufacturing some of the highest quality basketball hoops and basketballs for many years now which has led them to be the official basketball of the NBA. 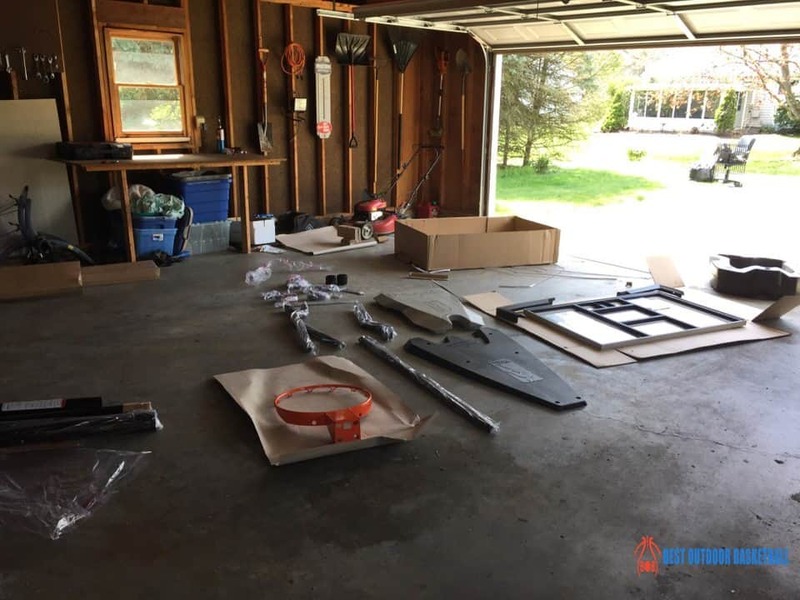 Knowing this we are very excited to give you an in depth rundown of the Hercules basketball hoop including what we like and what could be better about the system. The rim of the Spalding Hercules Portable Basketball Hoop is Pro-Slam style which we have seen before on the Spalding Pro-Slam Basketball Hoop. 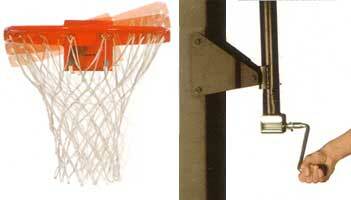 The Pro-Slam rim does have a breakaway mechanism, but would not be suitable for rough dunking or hanging. The acrylic backboard is 3.5 mm thick and will have some mild to moderate vibrations when impacted. As we have stated previously, acrylic backboards are generally better than polycarbonate, but do not perform as well as backboards made of tempered glass. The Hercules Basketball Hoop from Spalding has a three-piece support pole that has a 3.5″ diameter. We consider this three-piece support system a weakness as one or two-piece support systems are significantly more sturdy and durable. The base of this hoop can hold up to 39 gallons of water to keep the Spalding Hercules Basketball System from tipping over. During the Winter months you may want to drain some of the water out to avoid damage from ice expanding in the base. 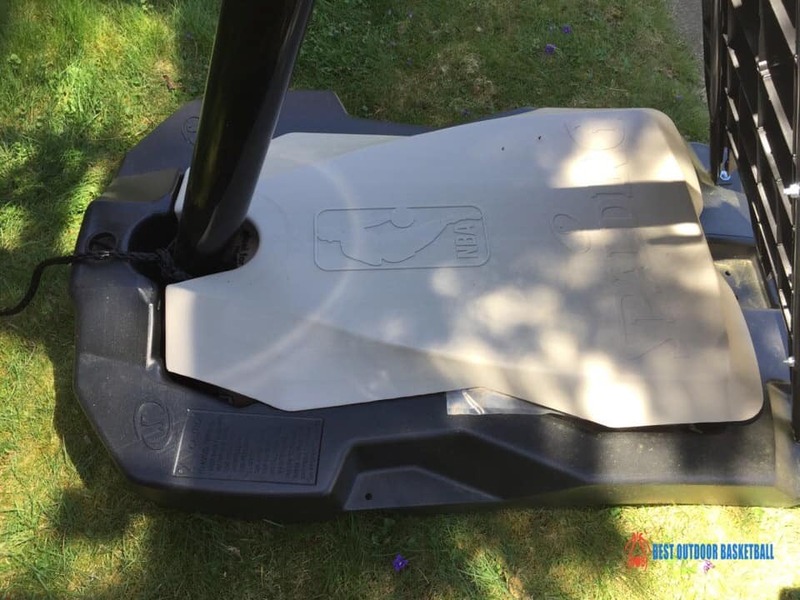 There are two wheels that are attached to the base that can used to help make transportation easier, however, do not expect to be able to move this hoop without first draining the water from the base. As far as assembly goes, you will most definitely want to have at least two adults working as a team to get this hoop put together. If you have two people working on assembly, then expect this hoop to take anywhere from 3-6 hours to be set up. Be sure to follow the directions closely and not assume you know the next step. If you follow these suggestions assembly should not be too difficult. 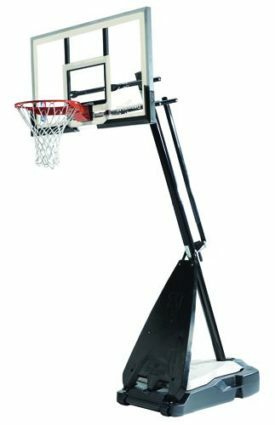 Overall, the Spalding Hercules Portable Basketball System is a quality addition to the Spalding basketball hoop lineup. If you are interested in another hoop that has similar features we would suggest you see our review of the Spalding Pro-Slam. However, if you want a hoop that has more features and higher quality materials then consider looking into “The Beast” Basketball Hoop from Spalding. 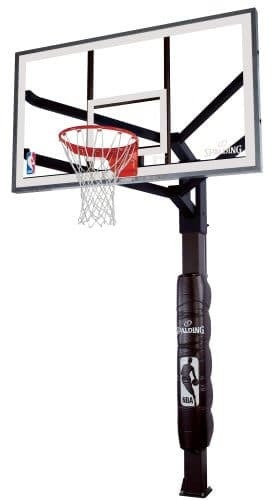 Spalding has for many years been a leader in the basketball manufacturing industry and that is why many folks have chosen to purchase the Spalding 48 inch Portable Basketball Hoop. Based on the reviews this hoop is not perfect, but for a more affordable hoop it is a solid choice. Here is our opinion on the what we like about this system as well as things that could be improved to make this hoop even better. 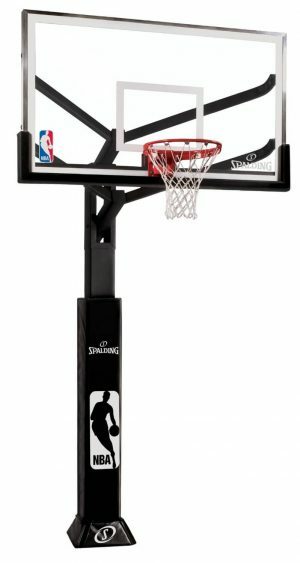 The first feature worth mentioning is that the Spalding 48 inch Portable Basketball Hoop can be lowered to 7.5’ and up to the regulation 10′. This is an advantage when you buying for young basketball players. The hoop’s base is big enough to support 37 gallons of water which will keep this system upright. There have been some reviewers who have mentioned that the base is susceptible to leaking and this is a cause for concern. 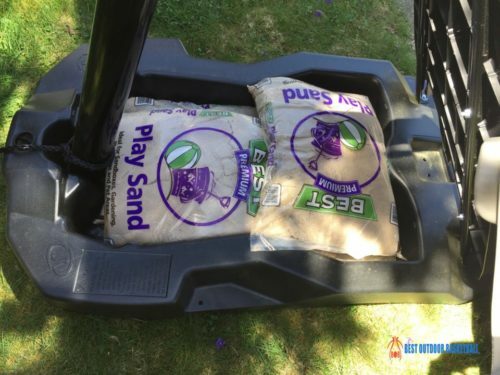 Now you do have the option to avoid this problem by choosing to fill the base with sand rather than water. Also, the polycarbonate material they used on the backboard very thin and will vibrate a fair amount when a shot hits the rim or backboard. While for most the assembly will be quite simple, the directions at times are vague which may cause you to miss a step or complete a step incorrectly. Because of this vagueness, some users resort to trial and error. We recommend you find a friend or family member when putting the Spalding 48 inch Portable Basketball Hoop together to make the process more efficient. Children will love being able to play on this hoop and we feel that it is a great selection for recreational use. All of Spalding’s basketball hoops provide a sleek look and durable feel, and the Spalding 48 inch portable basketball hoop is no exception. The Spalding 60 Inch Portable Basketball System finds itself marketed as a solid middle priced portable unit between the less expensive Spalding Pro Slam and the premium Spalding The Beast Basketball Hoop. 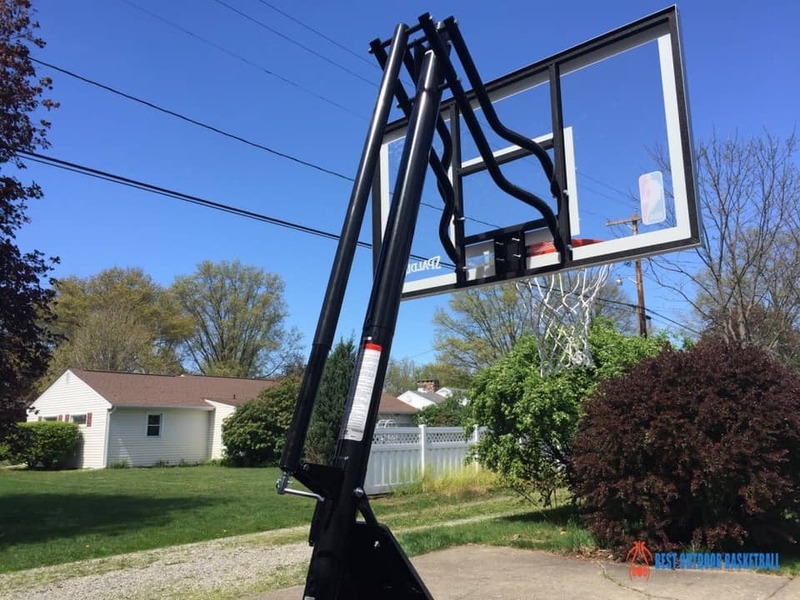 This is a really nice choice for anyone who wants to have a high quality portable hoop for their home but does not have +$1000 to spend on a system. 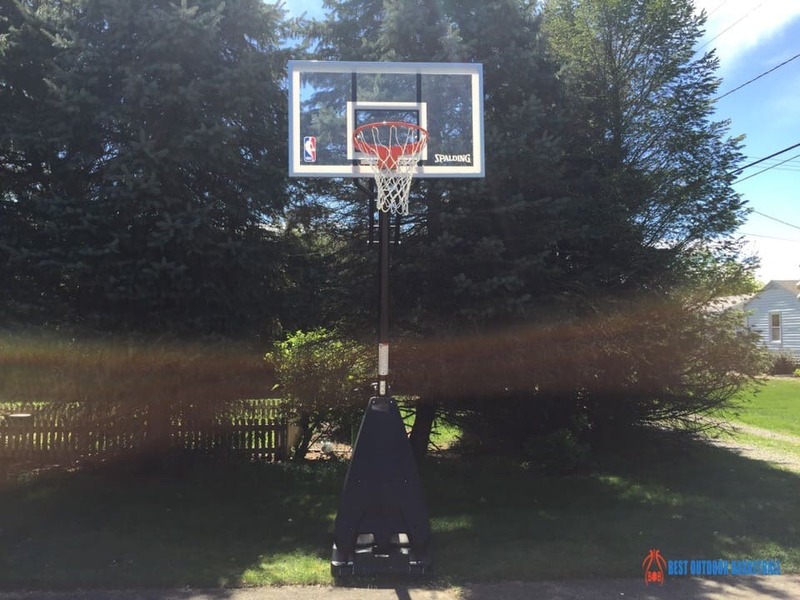 We would recommend this hoop for those who take the game seriously or for families who have a child who is into the game and wants to take their interest to the next level. At this middle level price you will find that the Spalding 60 Inch Portable Basketball System has a mix of higher end features with some other cheaper materials as well. 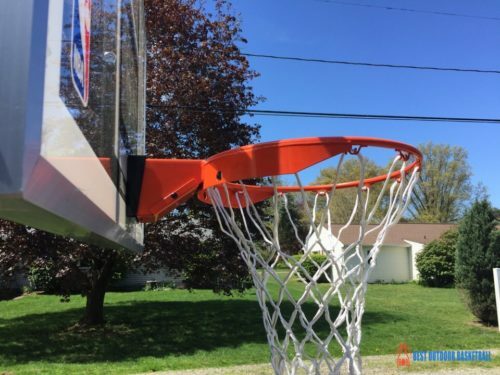 On the higher end side this hoop does feature a professional performing rim that has a quality breakaway mechanism so that it can take on dunks and other rough play. It also has the added bonus of padding that lines the bottom of the backboard which enhances safety. Another safety feature found only on high end portable systems is the pole guard that helps to keep players from running into the pole and base. On the flip side, here are some features of the hoop that tend to be found on cheaper units. 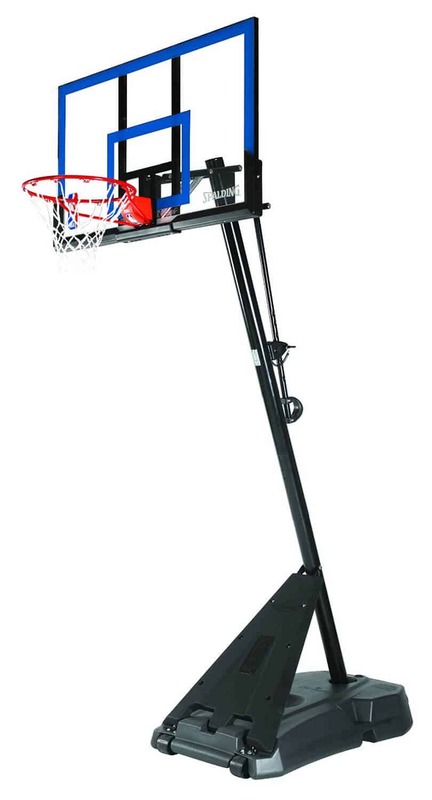 The Spalding 60 Inch Portable Basketball System has a 3 piece pole and support system. This is generally the least stable design on portable basketball hoops. Two piece poles are generally more secure, and one-piece poles are the most stable and are featured on the highest quality premium hoops. The acrylic backboard is better than the polycarbonate found on the cheapest basketball systems, but does not perform at the level seen from basketball hoops that have a tempered glass backboard. 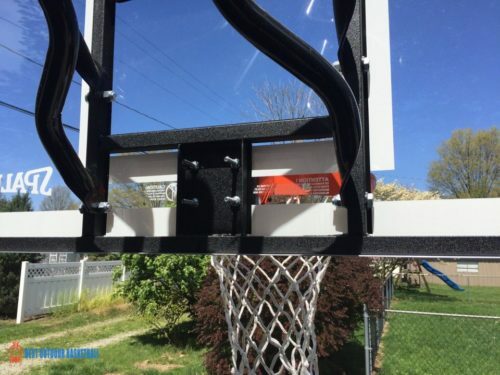 With an acrylic backboard this system will have some mild shaking when the basketball hits the rim or backboard, but it will still be superior to most portable basketball systems out there. If you purchase this basketball hoop be prepared to find a friend or adult family member to help you with the assembly process. This will generally take somewhere between 3-5 hours depending on your assembly experience and assuming things go smoothly. 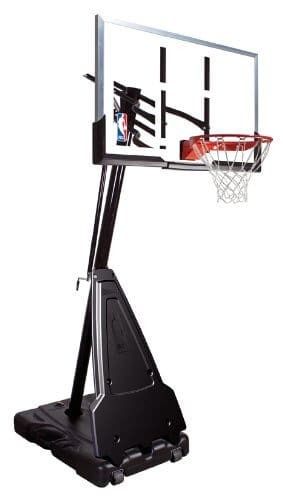 Pro Style Arena Slam Rim which allows for moderate dunking (we still would not recommend hanging on this rim as over a long period of time it could cause warping and damage). The three piece support pole design leaves this hoop susceptible to shaking. If you want a hoop with a two or one piece system be prepared to spend more money. The base can hold up to a solid 40 gallons, however, we have never seen a base that is too big. Making this a 50 gallon base would only work to keep the Spalding 60 Inch Portable Basketball System more stable and less likely to tip. Overall, the Spalding 60 Inch Portable Basketball Hoop is a wise investment that should last many years when used responsibly. While the hoop does have some features that leave a little to be desired, at it’s price point it performs quite nicely. If you are able to spend more and want a hoop at the next level we would suggest considering the Spalding The Beast Basketball Hoop. In the market for a portable basketball system for your driveway or backyard? Finding the right hoop is important so that you have the features you desire at the price you want, along with a product that is made to last depending on your level and frequency of use. 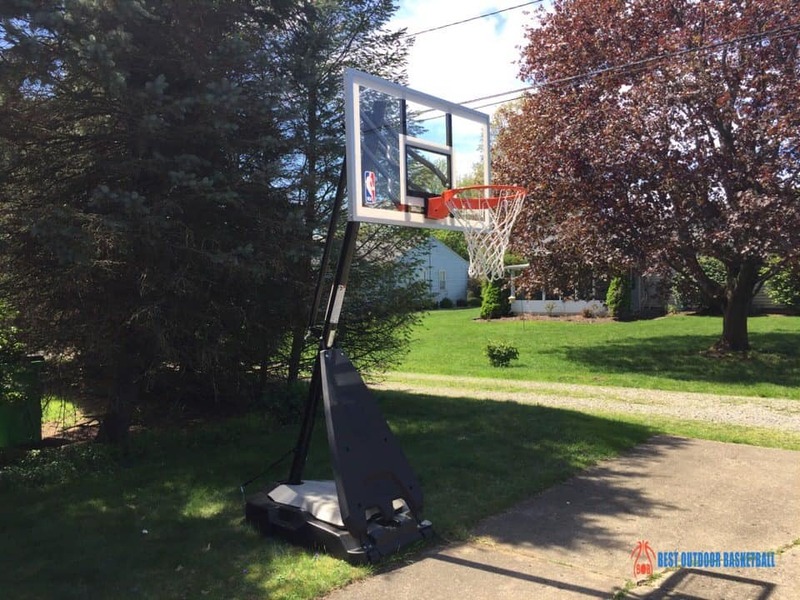 Spalding is a manufacturer of hoops that is time-tested and well-respected, and the Spalding 68564 Portable Basketball System is a great option if you are looking for something moderately priced, but a solid addition to your yard or driveway with some great features. The Spalding 68564 hoop offers an array of solid features for the baller in your life, be they young and beginning, or a veteran of the game; the hoop would be best for those looking to play recreationally and practice drills and shots on a regular basis. It features a large 54 inch acrylic backboard made for frequent play and practice. There is a heavy duty steel frame lining the backboard, giving you extra strength and durability as you go up for layups and slam dunks. 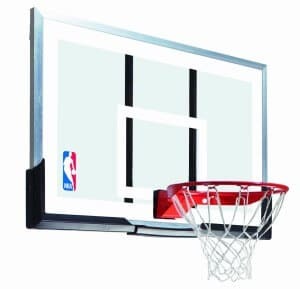 Acrylic backboards are a great option for those looking for a quality, strong backboard for bank shots and layups, without the high price of tempered glass; a great middle ground option. When it comes to adjusting the hoop height, the Spalding 68564 Basketball System makes things pretty easy. Thanks to the Screw Jack lift system, the hoop can raise from 7.5 feet to 10 feet in a smooth, one-handed motion. The hoop can lift in infinite increments making it able to be personalized to the height that works best for the player. It also has a removable handle so that once you have found your desired height, it cannot be tampered with. 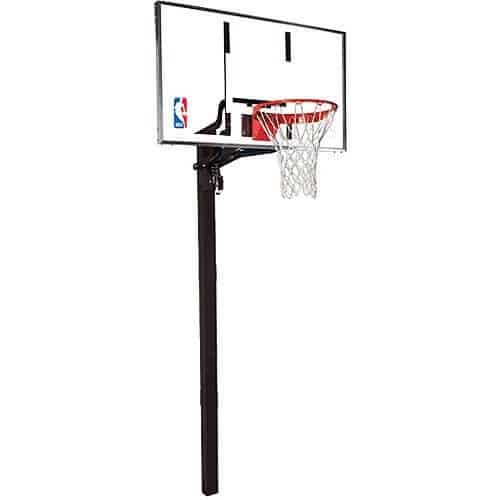 The Spalding 68564 has a 3 piece, 3.5 inch pole, which is set at a 20 degree angle from the base, with a plastic cover on the front gives you a built in rebounder when you play. The foundation of the Spalding 68564 Portable Basketball System is one of the larger models on the market, with a 40 gallon plastic base; the large size allows for a sturdy and strong foundation, minimizing shaking that can come with weaker or smaller bases on other models. You can fill the base with water, sand, or a polymer gel product to allow for little movement in your neighborhood basketball games and free throw work. Reviewers of this hoop found the base to be adequate and found it durable enough to withstand cracks and weaknesses in the plastic, where sometimes other hoops do not measure up. For those players who love to perfect their slam dunk, or even just complete their first one, the Spalding 68564 offers a great platform for such a goal; it features an Arena Slam breakaway rim with solid steel support braces. The smooth spring associated with the rim allows for it to give way when going up for that amazing dunk or layup, and minimizes pressure on the backboard, allowing for a stronger and longer lasting product. While this hoop has a lot of great points, one thing to consider is assembly. Many reviewers have found the assembly of this hoop to be time-consuming and difficult, with improper instructions or missing pieces. However, other found the hoop easy to assemble and did so with little help or time on their hands. Assembly can vary, but this is just one factor to consider when purchasing the hoop that is best for your lifestyle.